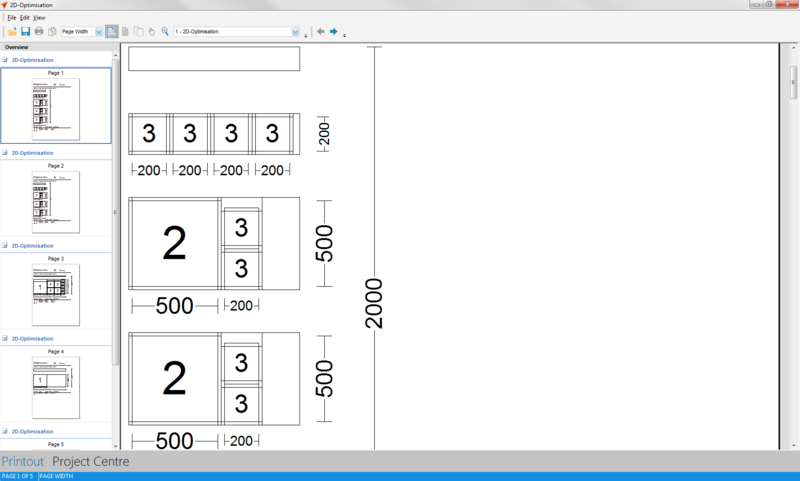 By using the 2D-Optimisation you are able to organize the material consumption of plates and panels more efficient. Under “Basic/Residual Sizes” the standard delivery quantities for small, medium and large sizes are displayed. You may enter individual sizes, e.g. material you have in stock. 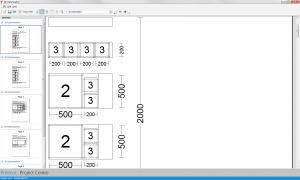 In the lower “Area” section you enter the sizes for plates and panels you want to create. There are three possibilities to enter new sizes. Make a right mouse click and select the option “Delete” from the context menu. You are also able to save jobs and to open existing ones. For saving your entries click on the button “Save Job” on the bottom left corner. To open an exisiting job please click on the button “Open Job” and select a file. Areas can be imported from other projects or from CSV and XLS files. 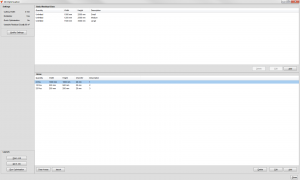 Therefor click on the button “Import” and select the option “from Job” or “from File”. Click on the button “Run Optimisation” to start the optimisation. 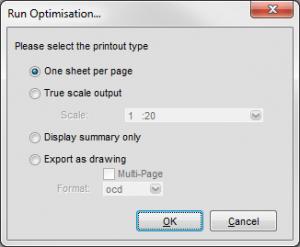 Here you enter the settings for the printouts. Click on “OK” to create the optimisation printout. 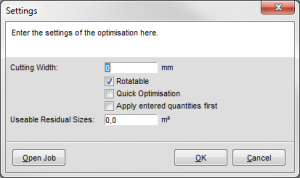 You may change the settings of the optimisation. Therefor click on the button “Modify Settings”. 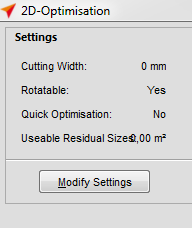 Here you modify the cutting width and the useable residual sizes.